When Robert E. Eloff was a probationary police officer for the State University at Buffalo, he was known to be heavy-handed with students, abused sick time and was forced to resign, according to five sources with knowledge of his police career. But the Buffalo Police Department was not privy to that information when he was hired in November 2007. To begin, the Buffalo Police Department never asked UB for his records there. In addition, at least one of the most serious incidents remained in a sealed court file and was not placed in his personnel records. And because Eloff was allowed to resign from the university police force, his personnel file was closed to future employers, according to Buffalo police. In fact, the Buffalo Police Department gave little scrutiny to Eloff’s background because he also had been a police officer for the Buffalo Municipal Housing Authority, which disbanded its department in budget cuts in 2005. Buffalo police officials confirmed that when former BMHA officers were being considered for the city police force, the normal hiring procedure of assigning detectives to conduct background checks on prospective officers did not occur. The background checks were deemed unnecessary for Eloff and other laid-off Housing Authority officers because they already had standing through their service as housing police, Buffalo police officials said. That failure to obtain Eloff’s personnel record from UB and do a more thorough background check may have been a missed opportunity to avoid a problem, given the questions surrounding Eloff’s actions in May 2014, when he worked off-duty to provide security at Molly’s Pub the night William C. Sager Jr. suffered fatal injuries. New York State government’s expert on public information said that the Buffalo Police Department did have a right to Eloff’s personnel file from UB. And the fact that Eloff had resigned from the UB police force should have raised concerns in a background investigation, according to law enforcement officials and others familiar with Eloff’s employment history. “Screening is particularly important when you are going to give people a badge and a gun. I tell my students all the time to prepare yourself for screening. Screening is of paramount importance in order to find quality candidates who can achieve the high standards expected of police,” said Martin S. Floss, chairman of Hilbert College’s graduate program in Criminal Justice Administration. Buffalo Police Commissioner Daniel Derenda, who was not commissioner at the time of Eloff’s hiring, said he was unable to comment on Eloff’s hiring. “Due to pending litigation, we cannot comment,” Derenda said. Eloff and Officer Adam E. O’Shei are under investigation by the FBI and the U.S. Attorney’s Office to determine if they violated the civil rights of Sager, who died from head injuries when he was pushed down a flight of stairs by Molly’s Pub bar manager Jeffrey J. Basil in May 2014. Basil has been convicted of second-degree murder. Eloff placed handcuffs on the unconscious 28-year-old Sager, an Air National Guardsman. O’Shei, contrary to medical protocol, moved Sager outside the bar. The officers, working off-duty security at the University Heights bar, also are accused of watching as Basil tampered with the bar’s DVR camera surveillance recorder. Soon after the Molly’s Pub incident, at least three individuals went public, complaining that Eloff had mistreated them, using unjustified force while working on- and off-duty as a Buffalo police officer. 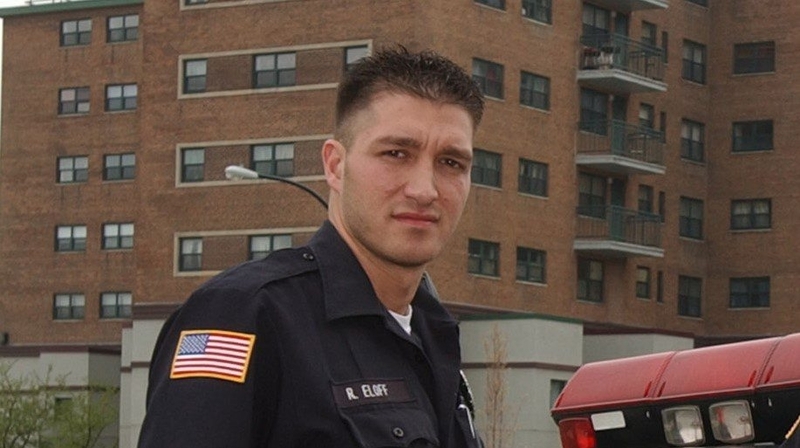 Before joining the Buffalo police force, Eloff was a probationary officer for the State University, from late 2005 through May 2007. During the 18 months he wore a State University police uniform, he roughed up students, according to three of the police and court sources who have knowledge of his record. They spoke on the condition that their names be withheld because they believe police personnel records are protected by state law or for other ethical issues surrounding the incidents. “Herb and I have made a determination that the information you have received is distorted at least in part. We don’t wish to comment further in the media. We would prefer to dispute the allegations in court, if necessary,” Glazer said. Phone calls to Eloff were not returned. In one incident at UB, Eloff was accused of attacking an international student he had stopped for suspected vehicle and traffic violations on UB’s North Campus. A search of the vehicle found marijuana. When the student asked Eloff if he needed a search warrant, Eloff slammed the student’s head on the steering wheel, according to two of the sources with knowledge of Eloff’s record. The student filed a complaint of excessive force against Eloff, and a deal was struck that allowed the charges against the student to be dropped in Amherst Town Court and the records of the arrest sealed. Court officials say they cannot release any cases that are ordered sealed. In another case, Eloff broke his hand during a physical confrontation with a student, according to two law enforcement officials. Despite reports of roughing up students, Eloff’s undoing at UB was his attendance record during his probationary period, according to three of the law enforcement sources. UB Police Chief Gerald W. Schoenle Jr. declined to comment on any aspects of Eloff’s employment, but said it is not unusual for another police department to seek a reference on a former UB officer. “Police departments routinely give references on former employees if the former employee signs a waiver,” Schoenle said. UB spokesman John DellaContrada said the university does not publicly comment on personnel records but confirmed that Eloff resigned from the university police force in May 2007. The resignation came when his probationary period was expiring. Questions on why he left UB were never addressed by the Buffalo police when he was hired six months later in November. Before working as a university police officer and Buffalo police officer, Eloff had worked as a police officer for the Buffalo Municipal Housing Authority. But the housing agency’s police force was disbanded in June 2005 because of budget cuts. After that layoff, Eloff went to the UB police and resigned in May 2007. In late November 2007, Eloff and O’Shei were among 12 former BMHA officers who were hired by the Buffalo Police Department after passing a civil service test earlier in the year. The city allowed them to be hired from the appointment list, no matter how they ranked, because of their past experience as police officers. Eloff’s personnel records from UB would not have come under scrutiny because of a state civil rights law that shields officers’ records from review, according to Buffalo police. But UB never received a request from Buffalo for Eloff’s records, another law enforcement source said. The city’s Civil Service Commission certified the 12 former BMHA officers – including Eloff – as acceptable for city police employment, according to H. McCarthy Gipson, who was police commissioner at the time the former BMHA officers were hired. “They passed the test and were recommended for hiring by Buffalo Civil Service,” Gipson said. When asked about background checks conducted on police candidates, he said it was his recollection that the former BMHA officers did not receive the same scrutiny as individuals who had never previously served in law enforcement. “They had already been in the system,” Gipson said. Even if an inquiry had been made of Eloff’s service at UB, Gipson said, it would be unlikely the city would have received any information because he had resigned. “Anecdotally, most of the time when you go for personnel records, the other agency will say they resigned and you don’t get anything more than that,” Gipson said. Eloff’s personnel records should be available for scrutiny in seeking new employment, according to Freeman, of the state’s Committee on Open Government. “Section 50-A does not apply in this case. This involves new employment. Subdivision 4 of the law states the prohibition regarding disclosure ‘shall not apply to … any agency of government which requires the records described in subdivision 1, in the furtherance of their official functions,’ ” Freeman said. When Freeman’s observation that personnel files are open to scrutiny by other government agencies was pointed out to Gipson, he again referred to the Civil Service Commission, which certified Eloff’s eligibility for employment. Under normal procedures, police officer candidates are subject to background investigations. The 12 former housing officers, however, passed drug testing, medical examinations and polygraph tests, police officials added. Gipson defended the hiring of the former BMHA officers without doing further checks. City police officials said former housing officers are no longer given preference in hiring. Floss, chairman of the graduate criminal justice program at Hilbert, said police investigators have the tools to determine if there are questions in a candidate’s background. “If a question comes up on ‘Why did your tenure not work out at this other place,’ and the investigator is unable to achieve closure on the question and reasonable explanations, then those issues should be considered for employment,” Floss said. He added that efforts are afoot to improve professionalism in law enforcement, starting with rigorous accreditation reviews of college criminal justice programs by the Academy of Criminal Justice Sciences. Eloff and O’Shei were initially placed on unpaid suspensions but under state civil service law, they resumed receiving their salaries after 30 days. At Basil’s murder trial, Eloff refused to testify, invoking his Fifth Amendment right against self-incrimination. O’Shei was granted immunity and testified, but that only protects him against the possibility of state charges. He still could face federal charges, based on what FBI agents find in their investigation. Greenman, Eloff’s lawyer, has previously said Belling was out of place and unfair in his description of his client. Attorney Joseph M. LaTona is representing O’Shei and he has said his client has fully cooperated with authorities and did nothing wrong at Molly’s Pub. Basil’s sentencing on the second-degree murder conviction has been delayed while State Supreme Court Justice Penny M. Wolfgang considers a motion by defense attorney Paul J. Cambria Jr. to set aside his conviction because one of the jurors’ past military service was not revealed at the time prospective jurors were being considered. Wolfgang is expected to rule on the request May 5. If the conviction stands, Basil faces a sentence of up to 25 years to life in prison.